How well do you know your Recyclables? Our public relations and social media strategy to encourage Victorian householders to recycle more at home shows that discrete guerilla-style bursts of activity online can support the aims of broader TV, radio and print campaigns. Sustainability Victoria asked Fenton to extend an existing statewide advertising campaign with four weeks of public relations and social media activity to help Victorians understand that there are more ways to ‘get it right on bin night’. We created a strategy to make campaign key messages more memorable and shareable by infusing the informational tone with humour, and using case studies to personalise and localise recycling messages beyond what was possible in traditional advertising. Kicking off with a ministerial launch, we planned a range of pitches to regional and metropolitan media and bloggers that would build on the momentum of the existing campaign and illustrate the premise with local case studies. Online, we used the campaign Facebook and Twitter pages to create and share original content. We created a set of characters in a biweekly comic called ‘Meet the Recyclables’ and a ‘Wheelie-wiz quiz’ with prize draws for recycling know-it-alls. 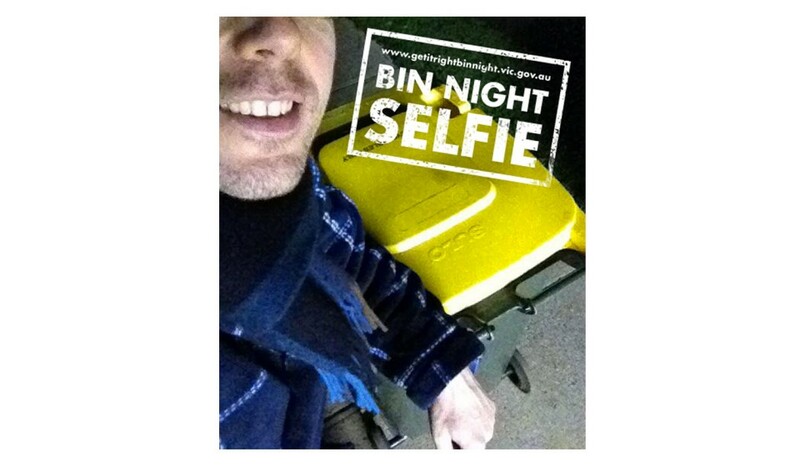 A ‘Bin Night Selfie’ photo competition celebrated bin-night heroes who bring out the wheelie on a cold night. We achieved coverage in a range of regional and metropolitan newspapers and local government publications. Levels of engagement and follower numbers on Twitter increased; Facebook likes increased by 37 per cent.